Back in 2010, I was inspired by a blog post written by Kim Brackett. Kim’s String Block Tutorial was easy to follow and I started making a pile of string blocks using her technique. 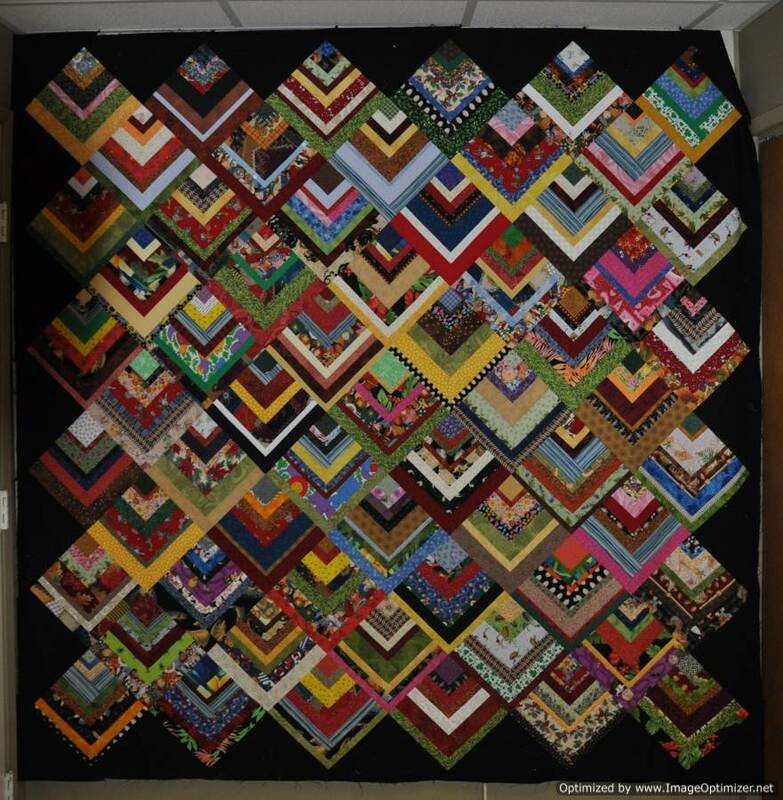 Kim never did post a picture of her finished quilt on her blog so I am not sure how she set her string blocks in her finished quilt. I played around with various settings for my blocks and decided that I liked the blocks set on point best. Today, I finally finished sewing my blocks together into a top. My blocks finished at 9 ” square. At this stage, my quilt top measures approximately 78.5″ x 79.5″. I haven’t decided whether or not I will add a border to this quilt. 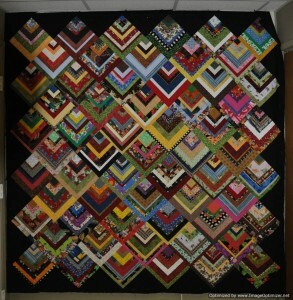 I like the look of the top without any further borders–the large chaos of colour seems to float on the quilt top. However, I will likely regret not adding a border to stabilize the edges of this quilt when it comes time to quilt it. I am sure that keeping the on point setting of the blocks with the bias edged setting triangles square while quilting will be a challenge I am sure. The next time I make this quilt, I think I will make the first square of this block the same size and from the same fabric. I think this will help to “tame” some of the wildness of this quilt and give the eye a place to rest. Just cut a larger square on both diagonals to yield four setting triangles. To determine the size of the larger square, measure the diagonal of the finished size unit block, and add 1 1/4 inches. this is the size square to quarter for perfect-fit, no-mistakes-allowed setting triangles. I prefer to add 1 1/2 inches to 2 1/2 inches to the diagonal measurement of the block. That size square will yield slightly larger setting triangles which allow the design blocks to float inside the borders. Using Marti’s method, I would have been cutting my squares 15 1/2″ square in order to get 4 setting triangles. In order to cut enough squares this size for my setting triangles, I would have needed more black fabric than I had on hand. However, using the ruler, I was able to cut my setting triangles from narrower strips of fabric and still have some fabric left over. This entry was posted in flimsy, half log cabin, string blocks by Norma Hanson. Bookmark the permalink. Wow! You did a great job! I love the “wildness” of it. I laughed when you said I never posted a picture — I never finished it! You’ve inspired to jump back on it. Thanks for sharing the picture. Nice quilt! I like that it is your header photo as well. To prevent stretching of the bias edges when quilting why not just add a narrow border (2-3″) for holding on to, and then cut it off when you trim up and bind? Good luck finishing it off!